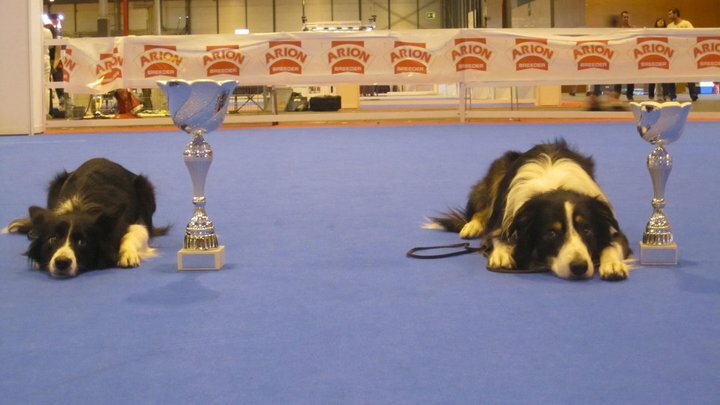 Interview with Eduarda de Sousa Pires Obedience Competitor and Judge. When did you begin to practice Obedience and why did you choose this sport? I started by doing “Belgium obedience”, as it was called, with my red setter, in 1998. 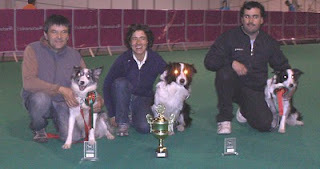 By then the Portuguese Kennel Club, moved to Obedience and we all started in that sport. By that time, Ulf Karlborg, a top obedience competitor from Sweden, was living in Portugal, we became friends and I had obedience private lessons. I was training to compete in class 2 and Ulf remarked that my red setter had the best heelwork in Portugal. In the next competition, during the heelwork, I did a right turn but my red setter did a left turn and off he went cross the ring, running straight into the green fields on the other side of the fences! And yes, there I was alone in the ring with everybody laughing! 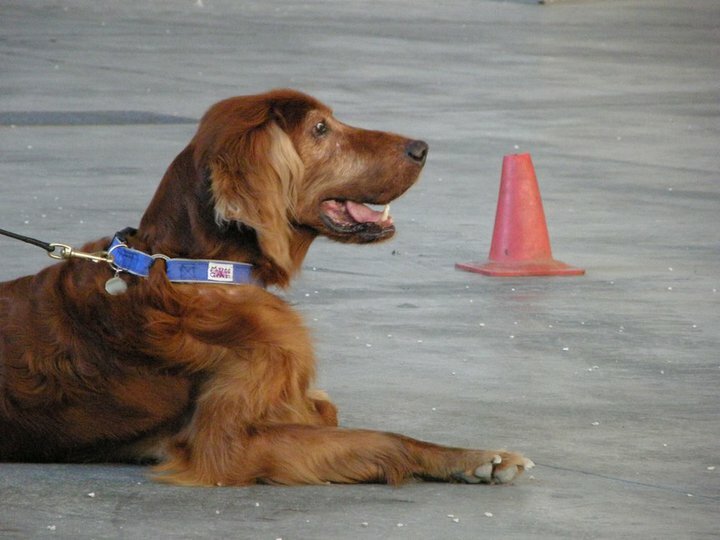 My red setter taught me some important psychological skills to compete in obedience: to train a lot, to be very patient, to be self motivated and to be able to keep going even after many failures. I can’t say that obedience was love at first sight! Back then, I thought it to be a boring sport full of mechanical performances! 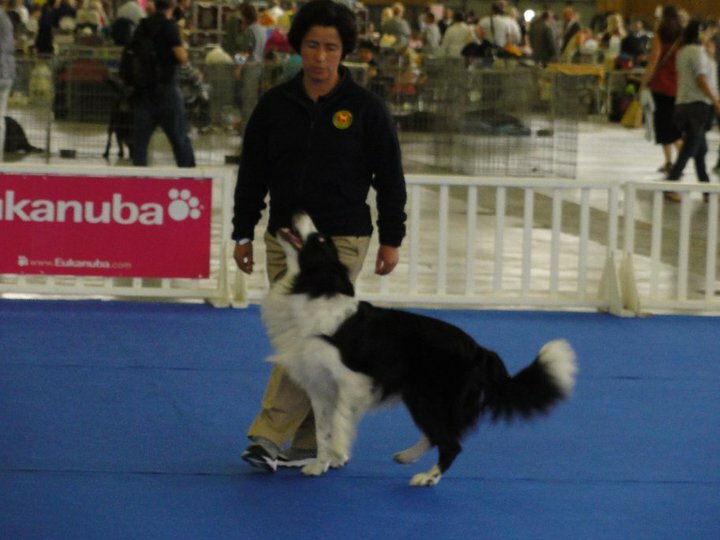 Actually, I realize now that this perception, while it is a common idea from outside viewers, is also one of the biggest challenges for the obedience competitions. Obedience is a sport that asks for very high and clear technical performances, but this makes performances to look like something a bit mechanical. Never the less, handlers and dogs know quite well that behind this mechanical appearance there’s a game going on! 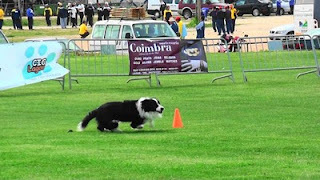 A game of “positive expectations” running between handler and dog while they are performing (with dog thinking: maybe my ball is coming after I do the cone? No? Well maybe after I do 3 steps of heelwork... And so on …) and that is something that no one else can see! It’s an undercover game! 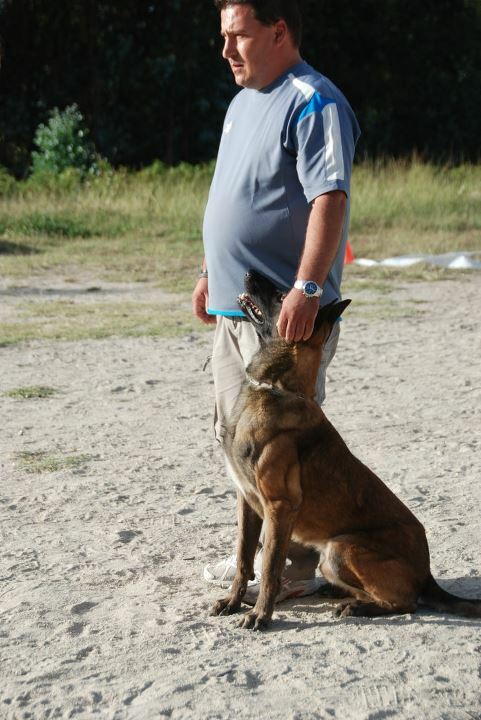 As Mr. Kruzbauer (president of obedience FCi) once said: obedience is prefection with fun! When did you become a judge? Is it more difficult to be a judge or a competitor? I become a judge in 2000. I bought my first Border collie, Mr. James, in 2000 and so I had plenty of time to help others. Besides, being a judge could be a good tool in order to become a better competitor, I thought. It may be difficult to be a good judge but it’s very important for the evolution of the sport. Judges are a sort of rules keepers. Judges keep an eye on the way exercises should look like, they put the performances on the right track by not letting an exercise to be done differently from what it’s described on the rules. Judges need to be strict observers and have a soft mind towards performances at the same time! In this way, they can motivate handlers but at the same time make sure that the winners are really the ones with the best performances. I like to see happy dogs coming into the ring and performing obedience as if they are in a game with the handlers and so sometimes when I see this I’m so impressed that I need to make an extra effort to really concentrate only on rules so not to be unfair to other kind of workers! It’s a difficult task but not as difficult as competing. In my opinion every judge should try to compete, because this makes judges a bit more tolerant inside the ring. I’d rather compete than judge, specially because to meet my own sense of balance I need to spend at least one hour a day with my dogs and quite often judging days means I’ll be out all day long. I return home very tired and needing to be with my dogs and to go together for a walk so I can reenergize and feel well! For me, competing is much more difficult then judging. In competition I need to focus both on my needs and attitudes and on Miles’. Mental training has been a good help. I’ve learned from my experience in competing and from observing and listening to other handlers that we don’t focus enough on learning how to compete, we are too absorbed with the exercise’s technique and we forget this so important part! This creates a gap that often leads to competition failures and the unnecessary feeling of not being motivated. When this happen we start to look for excuses or we blame our dog for mistakes, or blame the training techniques and most of the time we are just lacking the knowledge of how to compete! Competing is very difficult! I recommend all new handlers to start and read some coaching and try to learn how to compete as soon as they can. Some of us are very lucky to have seen you training. Could you tell us something about overtraining? I remember the first time I did overtraining! I put my hands on my head saying: oh my god!!! What????!!! This will ruin my exercises! 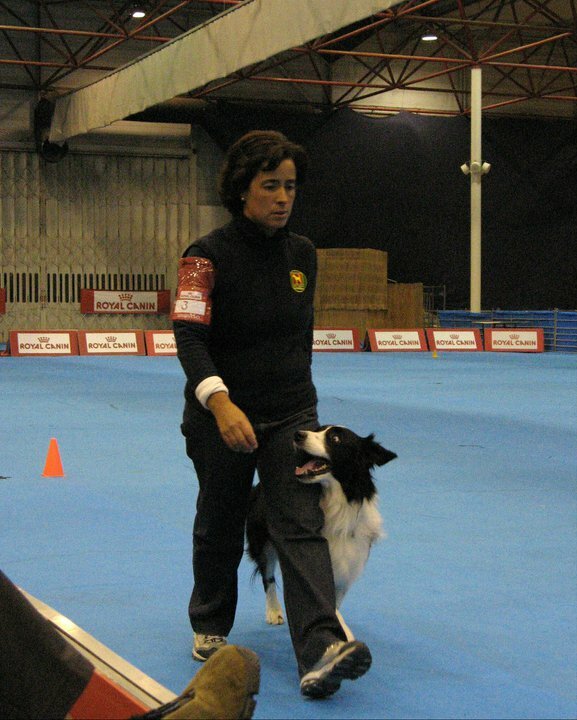 The idea of overtraining is actually quite simple: the way the exercises appear inside the competition ring are very clear, clear spot for the box, only six sticks for scent in front of the handler, a not so high jump, just a few people inside the ring, and so everything is so easy for the dog and the handler! And like these dogs can see competition as such an easy task, it can lead the handler and the dog to success and motivation. But for this to happen, training should be much more difficult and it’s here that overtraining matters! So sometimes box placement is in a difficult place with many other cones nearby, for the scent maybe there are 45 sticks to sent and nearby there are 2 dumbbells on the floor, etc. This is the general idea of overtraining an exercise. 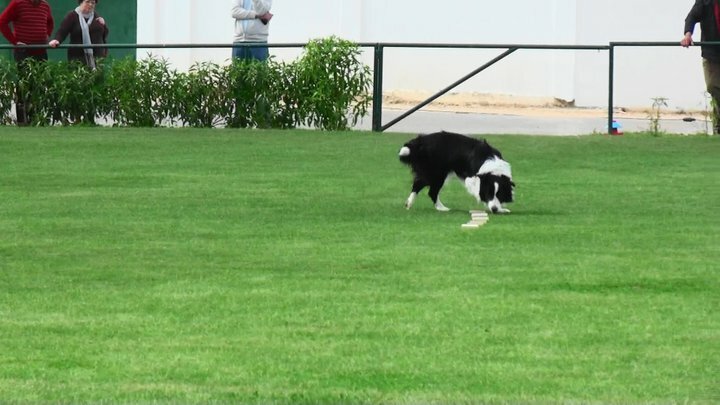 Overtraining can help the dog to be ready to focus only in the exercise and to ignore distractions inside or outside the ring - the dog can then focus and concentrate on the handler’s commands and on the behaviors inside each exercise. We need to create all sorts of distractions surrounding the exercise and generalize it while at same time we are still asking and helping the dog to succeed by doing that simple thing! We can have someone throwing balls, or dancing and running around us while we do the heelwork but we must tell our dog that no matter what it’s happening around us we are doing the same exercise and making it very simple. So when we get to work inside the competition ring it will be so much easier, because it’s only one stuart, distractions are very far. Overtraining prevents handlers from being afraid to face competition ring difficulties and when something goes wrong, like a stuart that don’t put the right apport in the floor and we need to wait or break the exercise, we will face it with calm and say “never mind we have trained for difficult things to happen and we are ready for it” and eventually our dog will focus even more on us because he knows that he needs it in order to accomplish the exercise! Overtraining creates confident competitors! I’ve learned these exercises with the obedience double world winner Kjellaug Selsaas who is my inspiration to training. Your dog Mr. Miles is a self-confident dog. How much time do you spend training him? I don’t think confidence is all about training, in my opinion confident dogs are dogs who have a nice life, who are protected and who grow up well socialized. Confident dogs are good competitors because, just like people, they don’t focus on mistakes and keep there trying hard! Sometimes I joke and say Miles wears a secret invisible cape of “superman” for going out of the house!! Unfortunately, in some competitions, his excessive confidence turned into anxiety and zeros came around but still he always has this nice ring attitude! One needs a lot of confidence to compete well and for that matter Miles is a bless and a great help to me. It was difficult for me to pass from Mr. James, a shy dog who did not enjoy being in the ring knowing that lots of eyes were on him, to this crazy – “let’s do it mummy!” dog. It took me a while to adapt. I usually train every day, sometimes just one or two behaviors inside the house. I also train when we are doing our daily walks in the park. It’s a relaxing environment and I make sure I have nice feelings inside the training session. I try to plan my training according to things I need to get better. Twice a week, I try to do a more formal session. Having a good training is so difficult to achieve! Sometimes I feel I’m rowing against a tide because I would like to train better but the environment around me can be hard and sometimes there are not so many people to help! Actually sometimes I don’t have any help to prepare myself to a competition! Lots of training sessions are surrounded by severe judgments form watchers - people who don’t compete but are always around. Sometimes these severe “judgments” also comes from other competitors. Training faults are faced as if it is a forever fault in the dog capacity, for example if in one training session a dog misses the box we will start to listen: ohhhhh that dog don’t do boxes!!! This affects handlers’ confidence and many times affects the way we train that exercise. 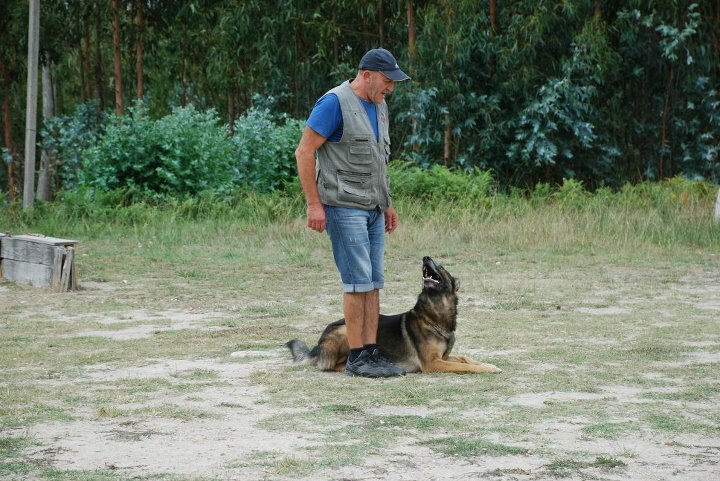 Quite often we even break to the point of putting too much difficulties for the dog, for example repeating and repeating the exercise, in that session. In the end and because we need to be confident to be good competitors this will affect the competition and the results!! It’s funny that here in Portugal we are still involved in discussions about defending positive training and we so many times forget that positive training doesn’t mean just using rewards and sending balls! Positive means being fair and respect the dog while we train. This “extra pressure” upon handlers training sessions or after some competitions makes handlers face it as something not positive and passing it to the dog! 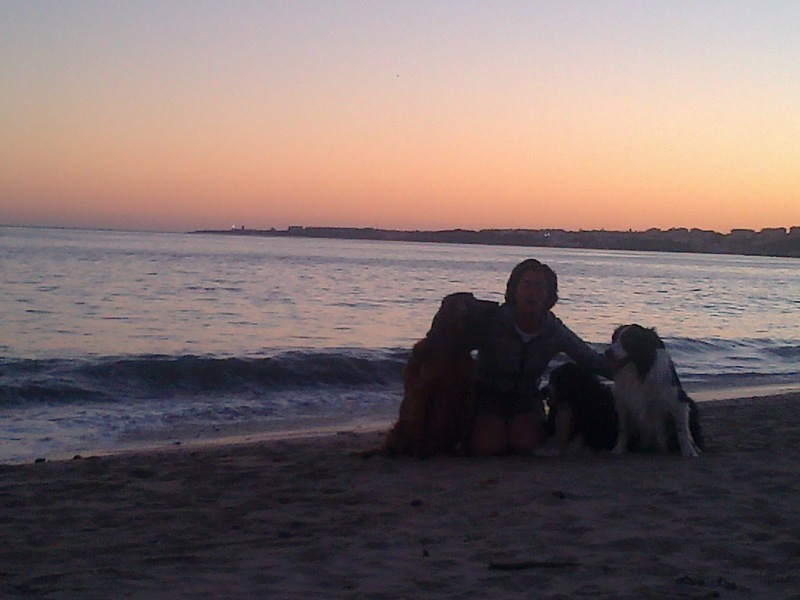 I’ve been rescued from these situations by getting back to the training rule: "play together stay together" with Miles! In your opinion which is the leading country in obedience and why? Well, clearly it is either Norway or Finland, last year we assisted to a great comeback from Sweden. Here my best thoughts go for Norway! 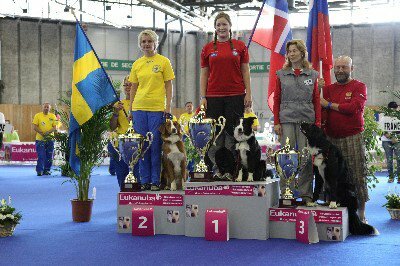 I think all competitors should have a source of inspiration and I’ve learned a lot from the best dog trainer in the world - the double world winner Kjellaug Selsaas - and Oystein Odegaard, both from Norway. I appreciate the way Nordic handlers keep and handled their dogs. These dogs are seen as high competition athletes there, which is very important for their well being. They sleep at the handlers’ bed, go out for walks pulling the leashes, play with other dogs and have a normal life as family pets! It’s very important to have events and seminars for top competitors to help them to get better and to provide them with events where they can test the exercises and have observers. I’ve just seen a group of finish girls doing a seminar and training and helping each other’s! I think this has proved to be the way to be good in obedience. Competitors share the knowledge between them and help each other to train and to be “the best”. Quite the opposite to us here in Portugal, where very often I don’t have any help to my training sessions not even when I’m close to a competition! We are just a few people in this sport and after some years this can be a major impeditive to our own growth! I guess Portuguese competitors from monitoring did so well in last world championship exactly because they all belong to the same club and train together and help each other’s. When things are not like this it’s not one competitor that doesn’t get better it’s the sport itself that doesn’t progress! Do you think that the latest changes on the regulations benefit the sport? Is it necessary to unify the lower classes? Absolutely!! Imagine a competitor that can go from country to country competing and training the same program under different judges and with different competitors. I think having the same program will be a major improvement for obedience. I’m really looking forward to it! I think with all lower classes being the same we won’t have countries with lower classes with exercises that are not good to elite like it happens with us. In our actual class 3 we have an exercise which is exactly the opposite to one in class elite thus making this a challenge and it can ruin the elite one! So all handlers will have a way to share the knowledge about how to train and we will all in the world share the same ideas and sport! I think this is a great improvement! Can you give us your opinion on the last world championship? And what about Spain? Are we still far away or have we got better in the last years? Uffff the world championship in Paris was a mess!!! Sorry!!! It costs a lot of money to a competitor to go there and compete. Money, energy, time and it was unfair to compete in such conditions!!! The ring was crowded outside and so noisy that my dog did not listen to me when I called him in the recall! Worst, the former obedience world champion by herself was speaking on the microphone announcing a break at the same times as a party in the side ring thus leading competitors to not listen to stuart. The stuart made so many but so many mistakes it was unbelievable. This world championship you really could see the difference from belonging to a team from a Nordic country or to belong to a no land team!!! I think we reached a point where we all understand this differences and know they exist and people will soon have to turn this to a more fair competition otherwise competitors will lose their motivation and the entries will become less and less except of course for Nordic countries! I can’t even remember what happened in that ring by now without being upset! Some competitors did 3 minutes of heel work other did five, some started in a place others in another, in the sit stay the stuart did a mess in my group and we returned to the dog coming from behind, it was unbelievable!!! Lots of people outside were complaining! The hotel was too expensive and very bad. We never knew if there was really a shuttle to the fair ground and at what time would it be!!! Everybody complains about Bratislava but except from noise around the ring, it was a fair championship and in the end of the day we returned to a fantastic place, a nice hotel, not that expensive!!! Last year the hotel released for obedience competitors was inside the airport shared with aircraft crews and only 2 extremely expensive restaurants to eat!! The rooms were small and expensive! In Portugal we have a sponsor of 400 Euros per person so we need a great deal of economical effort to go to the world championships and to see that people in the organizations don’t care about this and make money from us, it’s not nice! I think that if next world championship was not booked for Austria I would definitely take a break after this lousy Paris one! 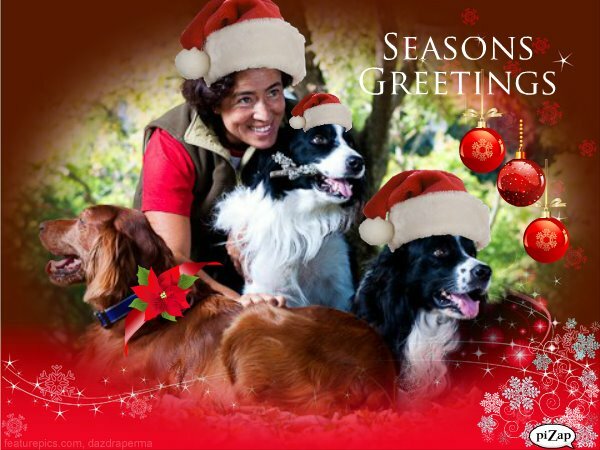 I have great expectations for Austria, a country very welcoming to dogs the place will be only for obedience and the stuart will be Gabriela, last year’s Austrian team leader who was a stuart in Austria 2005 and in Bratislava. She is a really nice stuart that makes competitors feel safe inside the ring! Spain needs to move a bit faster, I guess. I’ve seen good handlers and some good dogs! So please get together and go for it! I can’t understand why the sport is taking so long to grow in Spain and why there are no many more competitors!! Spain has improved a great deal on the technical part: almost everybody involved in OCI is now able to understand the demands of the exercises and can train it with success! Never the less it seems the competitive part is still missing! Sometimes I wonder if we, countries with not that much OCI competitors, should not forget all the normative stuff for a year or 2!!! I mean the selective competitions for world championship, the classes and all the demands until reaching elite class! I think this model is good for countries where OCI has lots of competitors and it has a long tradition! Many times I have wondered if by adapting this model too soon (also here in Portugal) we were not killing the sport by making it such a long long way. We put all the effort to reach the top class but the really effort should be to work hard on the top class and not just to get there! I wonder how it would be to stop this model for a year or two and start with a few handlers themselves who could create a sort of United Competitors of OCI (all competitors from different clubs) and do a bunch of initiatives, training, competitions, seminars and for a long period, imagine 2 years, with a common goal: enter the world championship, let’s say? 2012!? I wonder if Spain set up a program like this gathering some competitors interested in OCI with a Full focus and constructive evaluation of their progresses of the training what the result would be!!! 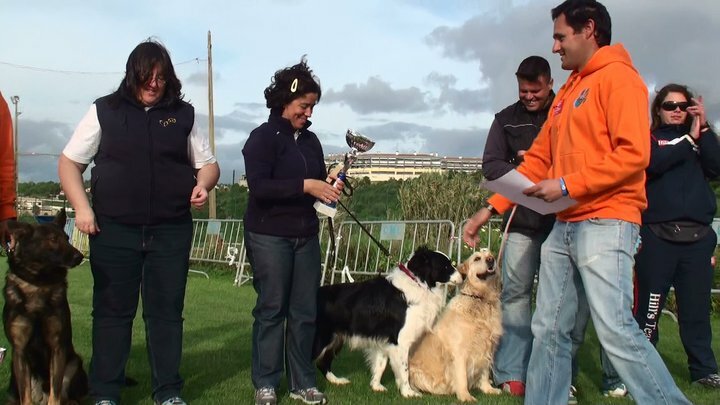 In Portugal every time we discuss the reasons why we still don’t have so many competitors we end up blaming handlers for being selfish and training for themselves and not forming new handlers, we even get to a point where people from former obedience committees wanted to forbid a handler to compete with 2 dogs in a competition! Of course this kills the handlers’ will towards the sport. And still we don’t seem to find out how to motivate people towards this sport! I hope Spain can, and in a near future, have a bigger team for world champ and much more competitors to national champion title! Even here in Portugal I could tell you a bunch of handlers who are so fond about OCI and who could engage in a program like this despite belonging to different clubs. Practicing obedience is enough to be all together; one doesn’t need to be close friends! We just need to do the same sport! Don’t be happy with small results like wining without having anyone in that class that day! Think big and even create, by helping, your own adversaries if you have to! When a student is better than the master, the master will be happy and finally he will have a good reason to set up new goals for himself! The final goal of OCI is to compete! 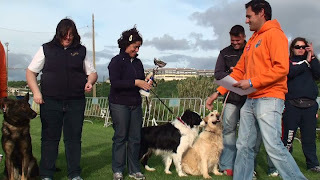 There are also 2 common mistakes responsible for some delay on having more obedience competitors! One is handlers too soon engaging in talking and talking about who is a better trainer or who is more positive! The other mistake is handlers engaging in helping and showing the sport to others (been there done that) too soon and then this will put them away from their own focus on competition because the focus is on other issues! Take football! Politics is a deal for the presidents not for the players! Players even have agents to negotiate their wages so their heads can be focused exclusively on the games!!! OCI game is inside the ring, is about getting nervous, unsecure, about learning how to support our dog when he needs us, how to be happy after a bad result and in a big event competition!!! Usually we like to train but we also need to learn and to like to compete! And as soon as we out go out there and try it, the better! I was so glad to see Gonzalo last year in Paris and being supported by a friend as a team leader! A very nice atmosphere but only one competitor? Why? There have been many years now that OCI is in Spain!!! I think now a great number of handlers are ready – know how to train exercises - and are just missing to compete and to train together with a common goal! My best advice would be: Invent a sort of UCO (united competitors of OCI), set a common goal and choose a trainer to help you and ask him to go to you 5 times a year, set regulars trainings, seminars, competitions, simulations with observers, be positive, help each other’s and wish others the best and I’m sure you´ll improve as never before! I wish you all the best! 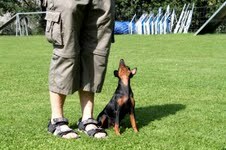 Dog Training worshop - a life with a dog! "Viva a vida com Cão - Workshop Treino de Cães"
- E agora? Entre o veterinário e o treino encontre uma solução. 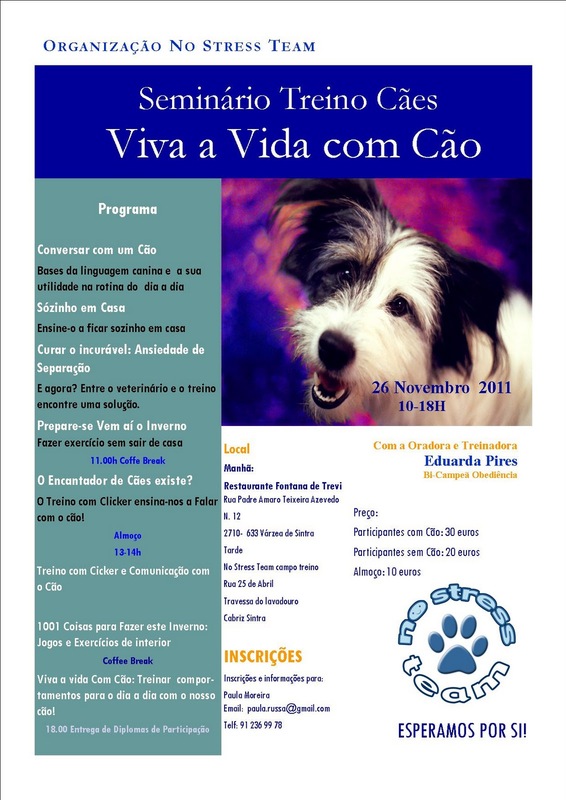 -O Encantador de Cães existe? - O Treino com Clicker ensina-nos a Falar com o cão! Tarde - Treino (Campo Treino da No Stress Team, Rua 25 de Abril, Travessa do lavadouro, Cabriz Sintra). - Viva a vida Com Cão: Treinar comportamentos para o dia a dia com o nosso cão! miles competition with no stress :-)! i guess we can finally laugh about this sort of private joke - Miles competition with No Stress. The competition was at september 18 and it was the 13ª competition from national championship 21 competitors. Theres a dog training club called No Stress Team and our best competition ever - 303 points, and with Miles being able to be fully focused and not stressed was at this club facilities. I wish to give a big big thank you to No Stress Team for allowing us to train in the ring field and for helping us on so many training sessions with no stress. After ou last world champioship result i guess we were needing the confidence of people around us who still beleieve we can do it to be able to keep going and trying! nobody said it was easy! and obedience surely it is not! i named it " litle switzerland just around the corner" - a combination of flat rivers, saling boats on the atlantic deep blue ocean releasing oxigen into the atmosphere and all embraced by deep green lean mountains! WOW! I was lucky on this trip i guess! Such an enormous positive surprise. 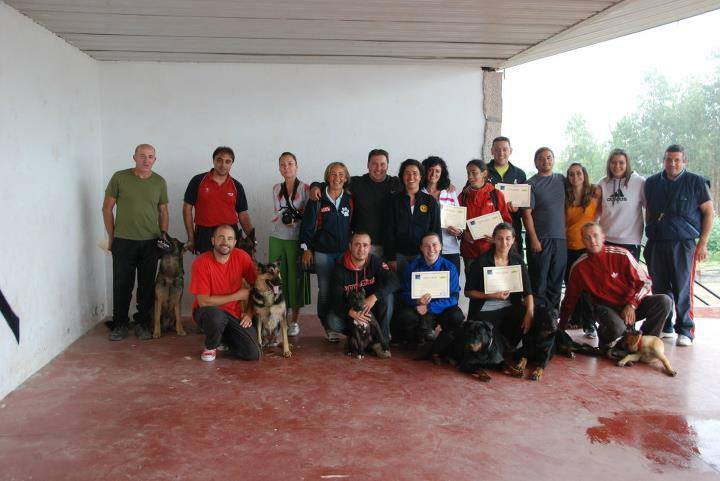 I was invited to present an obedience competition seminar. Most of the people who attend the seminar were coming from other sports mainly from IPO. It would be quite a chalange to help them getting their exercises better and at the same time motivate them to try and do a bit of obedience and work/training exercises with so many new ideas and diferent technics! well... it was quite a surprise to meet so many low profile and hard working people - People who came into the field with no reserves, willing to train in new ways, people who too regonize the dog training as a serious and hard working sport! Thank you so much to all! I hope youve enjoyed as much as i did. i hope ive help you with new ideas and inputs to train and reach your goals in sport. also i hope some of you can become Obedience competitors and share the love for this sport with me. I enjoyed the natural way we did this seminar eating and chating together and working focused. Luís its hard to meet some one like you! be a low profile is a virtue but not on dog trainers!!!! Usually dog trainers present thenselves as the best at something: the best for results, the best in the most positive technics, the best in the... something! to find someone as good as you are lacking the im the best speech and still so willing to learn, hard worker and so low profile is absolutly Unique :-)!!!! I wish you all the best - for your new puppy and for Terra Meiga. Thank you so much for you kindness and welcoming! Paris WOC a very French one! 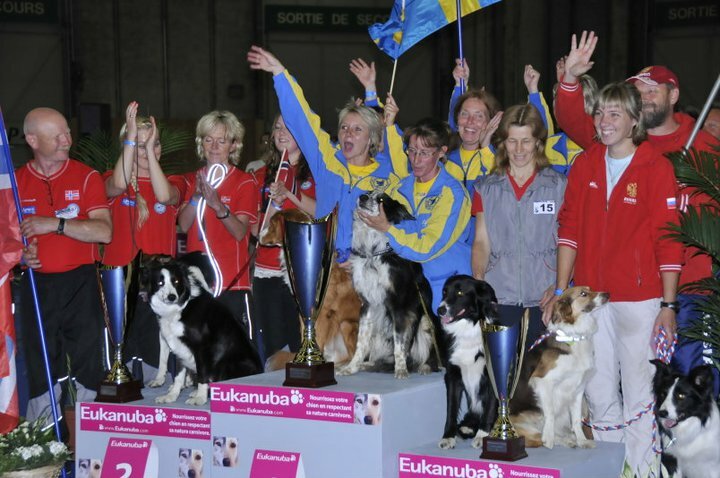 The Obedience World Championship 2011 was held inside one of the world biggest arenas for world beauty dog show. Goshhh such a Noisy and Crowded place! Fortunatly according to Mr. Kruzbauer - president of FCI obedience Committee this was one of the last world obedience championships to be held together with beauty ones - clearly it is a mess for obedience does affecting performances by so many means! This year i felt a deep respect and admiration for Obedience World Winner! Maren and Amira did a great Job inside the ring! Maren we were all needing inspiration! Congratulations! Miles travel by plane as if a frequent flyer. No stress, no fear! Despite our last years bad experience with Air France this year we had a very safe trip - so important! 4 Directed retrieve 8,00 7,00 media 7,50 CF 3/total 22,500 - very dificult to undersatnd this points !!!! unfortunatly the recall moment was same time as a celebration in the beauty ring and miles didnt hear me calling!! so we lost 40 points here and also for the next exercise!! Mr. Miles Competition - this competition... but... surely... a mix of ring stuart mistakes, a mix of overexcitement from miles a mix of lacking of connection from me to Miles ! Unfortunatly the stuarts did some serious mistakes! On the sit stay exercise we turn, and turn, until finding our way back to the dog from behind!!! never seen before!!! dont understand why judges didnt stopped it and call for a new enter but... well Obedience French style i guess... sorry everyone but" obedience exercises are "same sheet diferent day" ! and we like it like that!!! This year and despite congratulations from all people side to competition we should all be a bit sad either about ring conditions either about most of the performances. If we look carefully to the points most of handlers were showing mid results with most of the exercises being on the Very Good level and just a few reaching excellent level! Not that good for Obedience. As about ring conditions i think it was the first time we had such a mess made by stuarts,e.g. some competitors did 3 mintues of heelwork someothesr did 4minutes and... some started the exercise here, while some others started the exercises over there... some did the recall with no noise,t some others did th recall with so much noise dogs couldnt listen , some handlers return to their dogs as usual , some others return performing a set of turns and turns .... and ...departure time to competition place by bus: 6 oclock in the morning!!! returningto hotel : 07pm. All day spent inside such croweded expensive to eat, and full of noise, noise, noise, and noise!!! is obedience world championshiponly to people much younger then the majority of handlers, actually ????? ... well!! As a friend said we keep going... because...??? well because we love our dogs and we like to train as it means quality time with them! Special congratulations to the Sweedish team who made an enormous TEAM WORK among handlers and following their way of training :-)! very nice and inspiring! Jen D´Africa was for sure the best dog from Portuguese TEAM - with total points 246, 50. She did a very nice competition - a very serious old lady who did her best for all of us! Congratulations to Pedro and to Jen and thank you! Also Pedro Araujo and the team Border Collie Deena deep in my soul did well with 239,50! Fernando Silva and Amy II were not that lucky and a ring mistake got them a red card not being able to complete the competition. Next year we are all hoping to have a much safer world championship specially cause it will be in Austria one of the most dog welcoming countries in the World! Blood Urea Nitrogen (BUN) – a by-product of protein degradation that eliminated by the kidneys; high levels can indicate dehydration or kidney disease. Creatinine – a by-product that is eliminated by the kidneys; becomes elevated with dehydration, kidney disease, and urinary tract obstruction. Total Bilirubin – by-product of hemoglobin degradation and found within bile; elevations occur with destruction of red blood cells and bile duct/gall bladder disease and well as liver disease. the start list and the heel work is ready for Paris! 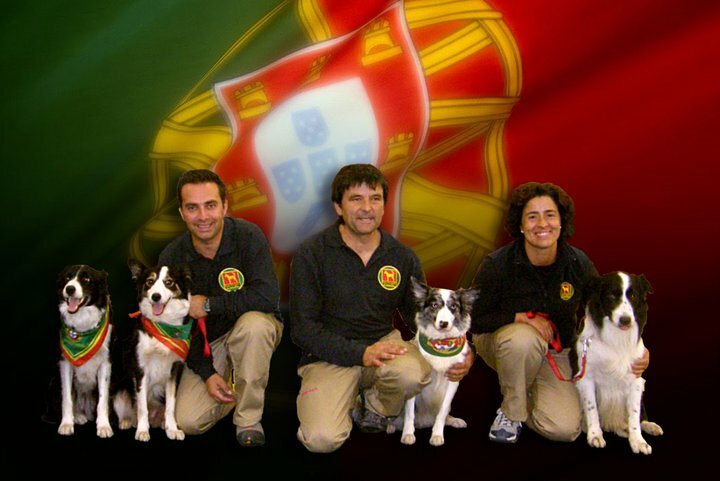 The portuguese obedience team to enter World Obedience Championship 2011 in Paris is ready ! Like in previous years we are gathering efforts to colletc some extra financial support. This year we organized a congress about dog training but also about many other aspects involving the sporting dog. WE,ve invited specialist to speak about themes as diferent as : the nutrition of the sporting dog; what is obedience; the importance of coachiong for athletes and many other. We hope people can join us in this congress and profit from this information ont sporting dogs issues! From now on and because so many friends have asked for it il try tol write more and more post in english :-)! We wish to thank the Spanish Kennel Club and the obedience delegate Mr. Pedro Marques for the invitation to again be at his side judging the " Spanish Copa" - Competition where the spanish obedience champion comes out. Unfortunatly in Spain as in Portugal obedience is taking to long to have a significant number of participants. Never the less the competition took place inside the halls of the big beauty show (100 years celebration)and the Spanish Kennel Club did everything so that obedience competitors could be at their best. The Spanish Obedience Champion is Gonzalo and Border Collie U-la. Congratulations. Gonzalo is a close friend who often competes in Portugal and many times do we train together! A Great pleasure and pride was to see Moss and Neo doing so well on class A. Both this dogs are the offspring of my dog Mr. Miles and from diferent litters. they presented themselves in class A and gain 1st and 2nd place on podium. 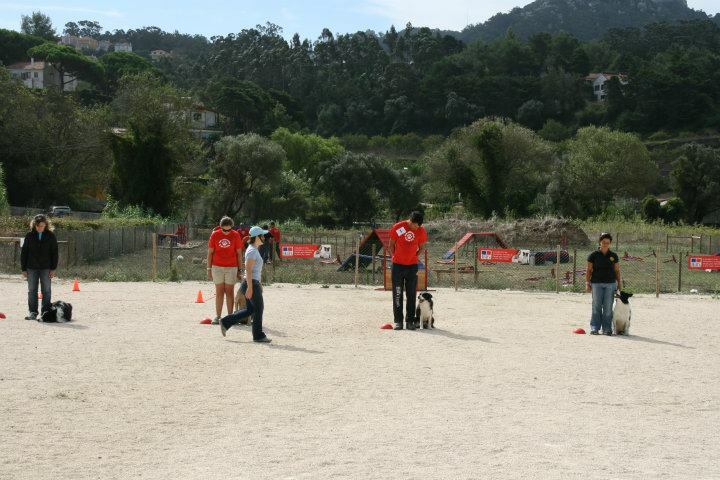 Both dog and handlers have been coming to train with me here in portugal and im so so proud of them. I wish them lots of sucess. This were great days between friends ! Thank you to all and hope to see you next year. A Selecção de Obedience de 2011 tem o prazer de oferecer a todos um novo SEMINÁRIO de OBEDIÊNCIA DESPORTIVA. Este Seminário pretende ser o ponto de encontro onde podemos levar os nossos conhecimentos a todos, praticantes e apoiantes desta excepcional modalidade, e ainda apoiar os praticantes mais novos, contribuuindo para solidificar o seu caminho no sucesso. Esperamos por si no Parque de Exposições do Montijo dia 23 de junho! Esta é a minha Maria! O ano passado numa sessão de coaching desportivo a psicóloga incentivou -me a fixar uma imagem de algo que eu gostasse muito, podia ser um cheiro; uma imagem.. qualquer coisa bonita, sensorial, para usar, evocar e me sentir bem! Aqui está! Quando preciso pensar numa imagem de Belo e que me faz sentir bem penso na Maria! Troféu Educacão Albarraque/ 13 Fevereiro 2001 - Esta foi uma prova recheada de sobresaltos! Na véspera o Miles magoou -se provavelmente a formar um salto e no dia da competição parecia particularmente cansado. A competição não nos correu bem e tivemos uma pontuação baixa - 213,00 pontos com Zero em dois exercicíos - Sentado e Discriminação Olfactiva. Mas... do mal o menos!! A competição correu mal mas devido a este incidente conseguimos finalmente e após longos meses de queixas e idas ao veterinário isolar um problema, decorrente da cirurgia ao intestino, e inciar um tratamento. As melhoras já são visiveis e o roger a jacto pareçe estar de volta com toda a sua energia. Assim, no IV tToféu de Obedience da CIC Lagos, 27 de Março, o Miles já estava de novo no seu "
Self" e fizemos um boa prova - concentrados e motivados, conseguimos obter Excelente em 9 dos dez exercicíos o que nos permitiu uma pontuaçao final de 301,50! mas.... ainda nao tinhamos acabado de receber o prémio e já o Miles cortejava a vizinha loira do pódio!!!!! Esta foi uma prova exemplar para todos os praticantes e organizadores de provas desta modalidade. Luís obrigado pelo alojamento 10 estrelas na família de acolhimento mais simpatica do mundo! Outro qq tinha se esforçado para que eu nem pusesse os pés em Lagos pois assim sobrava um lugar para a taça! é destas atitudes que se fazem os bons desportistas e as boas modalidades! O meu resultado devo-o também à tua hospitalidade. Foi um prazer concorrer em Lagos contigo e com o Cláudio espero que consigam os vossos objectivos e qualquer ajuda que vos possa dar DISPONHAM SEMPRE! Obrigado Steven pela ajuda a preparar o meu cão para entrar em ringue! Raramente conheço dias com esse apoio e ajuda! Joana obrigado pela disponibilidade no comissariado. Decorreu este Sabd, 29de Janeiro, o 7º Troféu de Obediência Fernando Galhoz. Esta foi a 1ª prova do Campeonato Nacional de Obediência e decorreu na Exponor - Porto. Pela primeira vez em Portugal esteve em ringue, juntamente com dois juízes portugueses, o presidente da comissão de Obedience da FCI o juiz - J. Kruzbauer. O Miles estava muito bem disposto, concentrado e cheio de energia. Ambos queríamos muito aproveitar esta oportunidade e por isso tentámos concentrar- nos em cada exercício da prova. Conseguimos um bom resultado final com 294,00 pontos - Excelente. 1º Lugar - Eduarda Pires e Mr. Miles com 294 pontos, Excelente. 2ª Lugar - Fernando Silva e Amy II com 235 pontos, Muito Bom. 3º Lugar - Gonzalo Figueroa e U-la a preta com 213, pontos Bom. Mr. Miles Campeão Obediência 2010! O campeonato Nacional de Obediência decorre de Janeiro a Dezembro. O título de Campeão de Obediência é atribuído ao conjunto -condutor -cão que realizar as 4 provas com pontuação mais alta, nesse campeonato. Este ano, infelizmente eu e o Miles fizemos um campeonato irregular pois participámos nas provas de Janeiro e Fevereiro e retomamos apenas em Setembro. Conseguimos estabilizar a maior parte dos exercícios no nível - Excelente. No entanto em algumas provas não pontuávamos num exerciíio e a pontuação final reflectia a ausência desses pontos. As provas em que pontuámos em todos os exercícios correrem muito bem e conseguimos pontuar todos os exercícios no nível - Excelente, o que no final do campeonato nos permitiu somar as 4 melhores pontuações do campeonato de 2010. Parabéns a todos os concorrentes de 2010! Este ano assistimos a duas estreias em classe elite . Luís Guerreiro com o pastor alemão Kane e Manuel Ramirez com o Labrador Tamariz B. Nestor. Força e votos de sucesso em 2011! Agradeço aos amigos os parabéns. E, para as vozes de burro que ainda nem o morto tinha arrefecido e já clamavam a injustiça ...e a vitória em 90 % das provas desde campeonato aqui fica o registo das provas e o Ranking da classe Elite em 2010!!! é EVIDENTE!!!! Enfim ...vozes de burro não chegam ao céu ! O bom desportivismo tenho a certeza que chegaria!!! !